Wimbledon 2018 Day 4 Highlights: Marin Cilic and Stan Wawrinka lost their second round games to exit. Wimbledon Day 4 Highlights: Simona Halep advanced. Wimbledon Day 4 Highlights: Top-ranked Simona Halep won the last 10 games to beat Saisai Zheng of China 7-5, 6-0 in the second round of Wimbledon. Saisai led 5-3 in the first set but Halep broke back for 5-5 and cruised the rest of the way against her 126th-ranked opponent. Novak Djokovic overcame an apparent thigh problem to beat Horacio Zeballos 6-1, 6-2, 6-3 and reach the third round at Wimbledon. Guido Pella of Argentina came from two sets down to stun third-seeded Marin Cilic at Wimbledon, beating last year’s finalist 3-6, 1-6, 6-4, 7-6 (3), 7-5 in the second round. Cilic looked headed for a routine victory before the match was suspended by rain in the third set on Wednesday but the former U.S. Open champion couldn’t find the same rhythm on Thursday. Kukushkin has broken Nadal in the third set and continues to fight back. After being down two sets, he is now leading 4-3 in the second. Guido Pella picks up the fourth match point and beats Marin Cilic in five sets. Guido Pella stuns Marin Cilic 3-6, 1-6, 6-4, 7-6, 7-5. Cilic is out in the second round and Day 4 is proving to be one for the upsets. It is into the final set between Cilic and Pella. But Cilic somehow manages to hold it. It’s 5-5 and evenly poised. Nadal continues to lead Kukushkin 6-4, 4-1 on Centre Court in their Wimbledon Round 2 encounter. Nadal saves a break point to hold for 4-3. However, Nadal takes the first set 6-4. Stan Wawrinka loses to Thomas Fabbiano 7-6 (7), 6-3, 7-6 (6). It was the Italian who had a match point on his serve at 7-6. But a poor mistake on the backhand side from Wawrinka results in his ouster. Quite an upset on day 4. Stan Wawrinka has gone down two sets to Thomas Fabbiano. Wawrinka, who was leading 3-1 at one point, needs to win a third-set tie-break to stay alive. Rafael Nadal is facing Mikhail Kukushkin on Centre Court. A brilliant opening game and the Spaniard holds his nerve to take an early 1-0 lead. Ashleigh Barty has won her singles contest against Eugenie Bouchard. The Australian 17th seed completes a 6-4, 7-5 win. A shocking exit for Bouchard. Naomi OSaka has defeated K Boulter 6-3, 6-4 to enter next round. Eugenie Bouchard has lost the first set to Ashleigh Barty 6-4. Naomi Osaka win first set against K Boulter. Angelique Kerber wins first set against C Liu. Order of play on the main show courts on the fourth day of the Wimbledon tennis championships on Thursday. 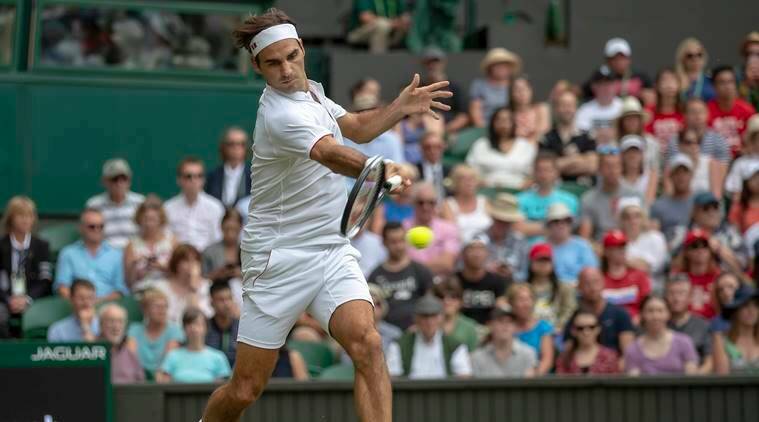 Top seed Roger Federer’s bid for a ninth Wimbledon title gathered momentum after he cruised into the third round with a 6-4 6-4 6-1 win over Slovakian world number 73 Lukas Lacko on Wednesday. The 36-year-old Swiss did not face a single break point and struck 48 winners as he extended his winning streak to 26 successive sets at the All England Club. Federer will next face Germany’s Jan-Lennard Struff, who edged past Croatia’s Ivo Karlovic in five sets. Seven-time champion Serena Williams proved too powerful for Bulgarian Viktoriya Tomova in a 6-1 6-4 win as she continued her steady progress on her return to Wimbledon, having missed last year’s event after taking a maternity leave.